Forging develops homogeneous, fine-grained metallurgical structures for the purpose of imparting strength and ductility in the forging cross-section. 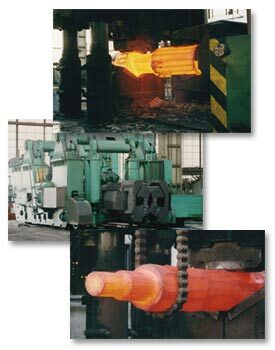 Our specific selection of ingot size to finished product diameter produces excellent forge reduction in order that products receive the required mechanical properties needed to meet customer specifications. Forging is performed on our 4000-ton hydraulic computer controlled press, retrofitted by Pahnke Engineering. This unique forging operation has dual fixed rail manipulator capability with 60 and 30 metric ton capacity. Both manipulators offer fully integrated CNC ingot handling units located on both sides of the forging press. The Pahnke patented software runs theoretical forging setups prior to forging as well as controlling the actual forging process.